When last we wrote to you with any regularity there was only one River Crew baby. Now there are four. Even the style of beer we prefer has shifted. While our group text once focused on finding big, dark, barrel-aged stouts, most of us now prefer bold, citrusy Northeast DIPAs. We use the word dank a lot. Brew days have been few and far between. Before loading his gear into a Penske truck and leaving Texas, our brewmaster Andy stirred up some pumpkin ale and let it spend time in a bourbon barrel. 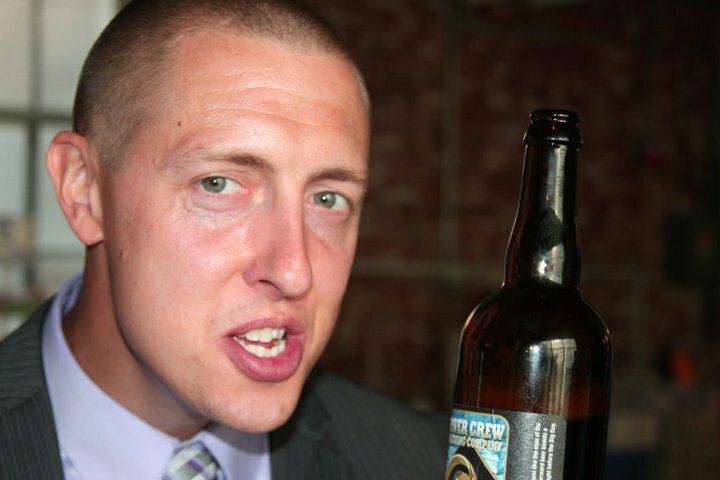 That beer was served at his brother’s wedding. 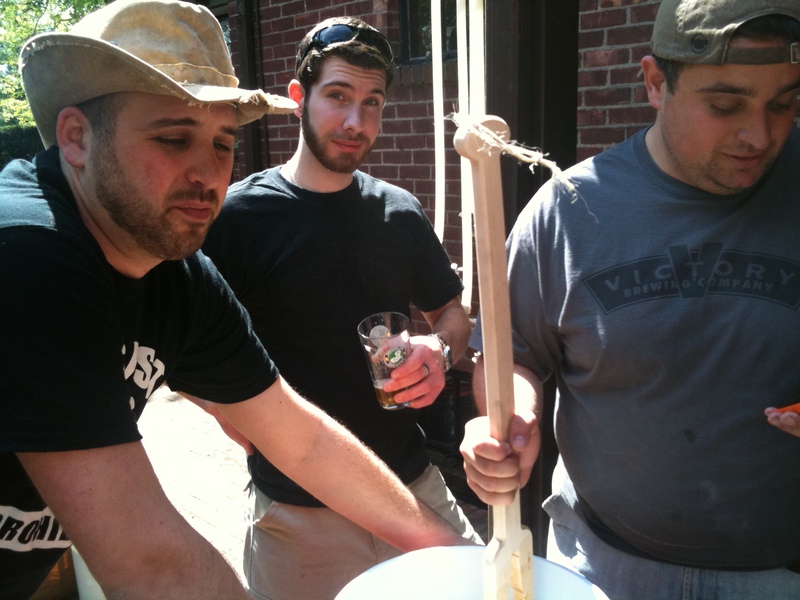 Then late last summer, three of us got together on a sweltering day and got to work on a hop-forward rye IPA. Brew day went perfectly, for the most part. Our kettle had trouble with the boil — we’ve since upgraded — but the smells coming from Andy’s new garage — a lot of Nelson Sauvin hop juiciness — filled the neighborhood. The beer was gorgeous and the smells were righteously dank. We had high hopes for what we called Clear Ryes, Full Hops, Can’t Lose. And here is where this post turns into a rumination on failure. The beer never lost its smell (thanks, dry-hopping! ), but the pine and juice dissipated from the taste profile. We were left with a very nice, coppery, slightly spicy ale that, honestly, was something of a let down coming off a bright, exotic nose. We still drank it, of course, but for the most part we wondered what could have been. Andy was devastated. He’s a craftsman in the truest sense of the word, and he’s sure that he did something along the way to make it all go awry. But of course that is nonsense. These things happen when you’re dealing with delicate hop flavors and using a homemade system that calls for lots of jostling and introduces the chance for oxygen to get to the product on numerous occasions. 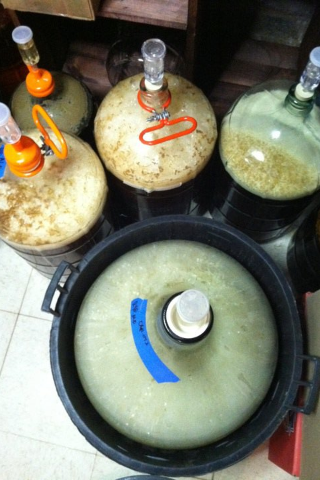 In brewing, and in life, you often deal with knowing that you’ll never really know where something went wrong, or why. All you can do is try again. We’re going to do that on Saturday. It’s not the right time to go after Clear Ryes again — we envisioned it as the perfect early fall beer — and we’re excited to produce our own interpretation of a hazy NE IPA. We’ll tell you more about it later this week. Can you spot us cheering our head off? Ahhhh – the event that kicked us into high-gear. 2104 was the first year we entered BrewRiot, having only attended the year before. Before this, we had only entered 1 other competition – Deep Ellum’s Labor of Love in 2013 – where we had a pretty good crowd response to our beer. Going into the event, we had no expectations whatsoever. All we wanted was some formal feedback on our beer to help guide the refinement of our recipes. In fact, it was the first time we ever brewed our Streets Run Red Ale, and the first time we added the lavender to our Baby I Like It Raw Wheat Ale. And man, were we ever surprised! We took 3rd Overall in American Ales for Streets Run Red (and 2nd in the Amber Ales category), and the Lavender Wheat took 3rd in Wheat Ales. But better yet, there was a palpable buzz around our beers, and person after person kept coming up to our booth saying “We have to try this lavender wheat” or “My friend told me your Red Ale is so good!” It was really rewarding to see and hear all these beer fans loving our brews. BrewRiot 2015 is just around the corner on May 17th – not like we’re counting down the days or anything. We’re looking forward to another great showing. Get your tickets here. If you come, stop by our booth for a few brews and say hi! A big part of our changes moving forward is fine-tuning our recipes. Over the years, we’ve developed quite the portfolio of beers (and stories to go with them). As we look into making the leap from homebrewery to craft brewery, we really want to focus on the ones we like the most and hone them in to be consumer-ready. For this, we’re basically brewing batch after batch of the same beer, tweaking something different with each. What we change is based on a combination formal feedback we receive from competitions, our goals for the beer and our own personal tastes. For instance, it could be moving to an all-Citra hop bill, like we recently did with the Treefort Plunging Pale Ale. Or lowering the FG on our Streets Run Red Ale. Some beers, like the Baby I Like It Raw Wheat Ale, are already in good shape, especially after our great showing at BrewRiot. Others we only brewed once, and need to adjust the recipe to our system and focus on consistency. And we’ve still got even more beers in our head that haven’t even been formulated yet. So we’ve got a ton of brewing and refining to do before we start thinking about making the leap, and we’re really looking forward to it. Check out our What’s Brewing Next page to see what we’ve got planned and follow our progress. Yeah, yeah. We know – it’s been forever and a day since we actually posted something on here. But we haven’t been sitting idly by; we’ve been hard at work behind the scenes, and a lot of our hard work is just about ready to be shared. Promoted by our strong showing at Brew Riot, we embarked on an effort to develop our marketing and branding. Our main focus was getting the right look and feel established for our brand – creating something memorable that we can build on as we grow. First up was our website. As you can see, it’s light-years ahead of our old site. We’re still getting it set up and learning it’s full functionality, but we’re really excited about all the things it can do and how it can grow with us as we move forward. Next, and probably most importantly, was our logo. This is our first attempt at really crafting our visual identity, and we want something reflective of our brand that has a lot of staying power. The need is driven by our presence at local homebrew festivals, but this logo will go well beyond just events and turn into an anchor for everything we develop. We’re currently working with a very talented designer to get this done. A version appears at the top of the site, but stay tuned for the official unveiling of the completed logo. Big things are on the way for The Crew. Stay tuned as we continue to build towards making the leap from homebrewery to Craft Brewery. This collaboration brew’s a throwback to IPAs of yester-year. A nice malt complexity sits underneath an aggressive and floral hoppiness, all topped with an oak-aged smoothness. Here’s the recipe for Kicking It Old School, an oak-aged IPA from the old Ballantine Brewery with Mike from New Jersey Craft Beer. It was based on the recipe outlined on East Coast Ale’s Facebook page and modified for our set up using BeerSmith. 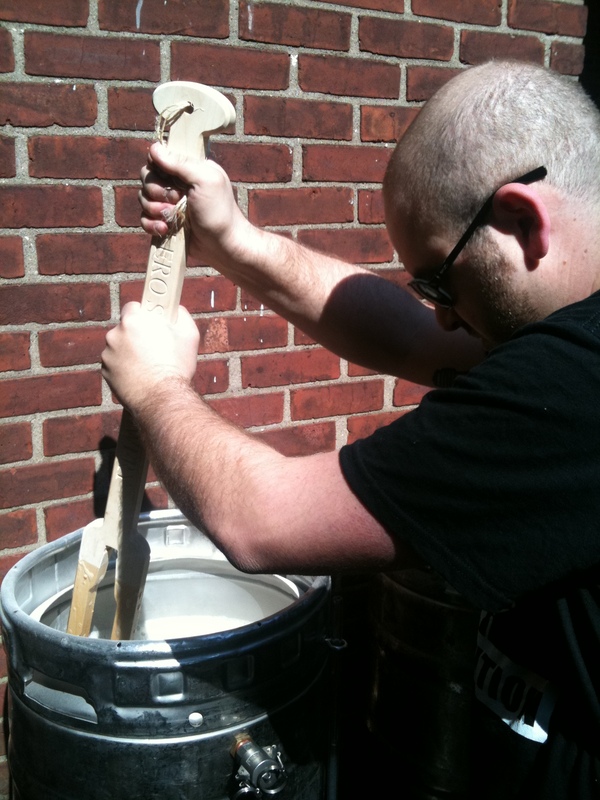 National Homebrew Day was back on May 7th of this year. It celebrates the day Jimmy Carter legalized homebrewing in 1979. Each year homebrewers celebrate with a Big Brew day, gathering their friends and fellow brewing geeks to celebrate by making beer together. Bob Olson of Bolero Snort Brewing Company, the resident #BrewYork big-thinker, put out a call to all the #BrewYork homebrewers to see if anyone was interested in getting together for Big Brew Day. Andrew Maiorana of The Druery, Mike Kivowitz of NewJerseyCraftBeer.com and myself answered the call. Bob had just gotten himself a new 3-burner rig, all of which had keggles we could use as brew kettles. Bob and Andrew had brewed together before and already had designs for their brews. Mike and I were paired up to take over the 3rd burner and had to decide what we wanted to brew. Brew Day at Bob’s was great. He’s got a heck of a set up. I had a good time using it, and now have visions of something similar. It always good to be around brewers of this caliber on brew days. You can’t help but learn something. And, even though I was relatively new to all-grain, I was able to offer suggestions and help out with the other brews, which made me pretty proud. The beer came out pretty tasty. Unfortunately we weren’t able to get a hold of East Coast Yeast’s Old Newark Ale (which is apparently the Ballantine from the old brewery). But the American Ale strain we used did well, even though it took its time to finish. 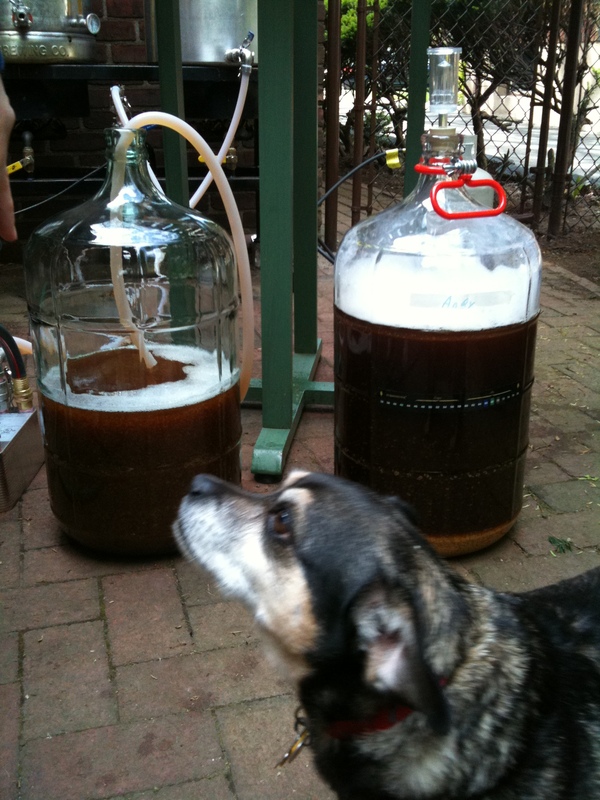 Bob did a great job taking care of our beer as they fermented at his place. The amarillo dry hop we did gave it a great citrus aroma. The 90 IBUs are definitely there, but they don’t overshadow the malt bill underneath. The oak cubes aging in the beer are really smoothing everything out, adding another layer of complexity to an already complex beer. Keep your eyes out for more collaborations between this crew, as we made some great beer and had an awesome time. From this day forth, Timmy’s Polarizing Porter will be known as Put Your Boots On Porter. Why the name change, you ask? 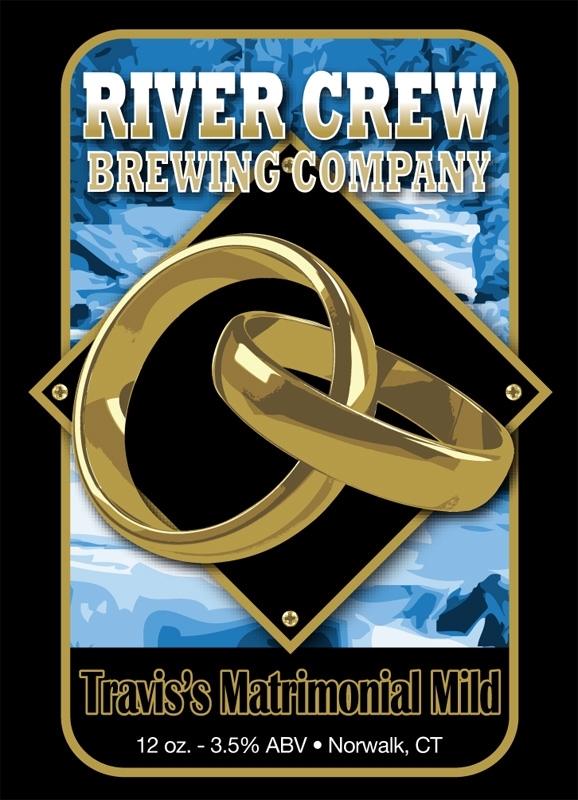 Well, The Beer formerly known as Timmy’s Polarizing Porter was the first beer I brewed under the River Crew Brewing Company banner. Back then, all I knew is I want to make beer inspired by the River Crew, and I thought it’d be fun to name it after them. As my brewing experience grew and I got more beers under my belt, the brand started to evolve. Beers started getting named after our stories and memories together, and not after individual people. It focused more on what we shared together, and culminated in the invention of our tagline: Get Crewed. This name change falls in line with the refined direction of the brand. Timmy’s Polarizing Porter was more about Timmy and less about the Crew and what we did together. “Put Your Boots On and Go Home” is a phrase that came to it’s infamy in high school, and still gets tossed around with regularity by the crew today. It was only fitting to switch things up and name a beer after it. This beer is mild in kick but full of flavor, just like the man of the hour himself. This lightly-hoppy, malt-forward beer boasts a toasty, carmelly flavor – perfect for a long night before the Big Day. Since this beer tasted pretty good, I thought I’d share the recipe. Be sure to check out the notes behind this recipe’s formulation. Travis’s love for the Yards Brawler gave me a nice starting point for this beer. Being able to taste a beer as a reference is a huge help in designing something similar. And this beer stands right up next to the original. Actually, I think it has more maltiness than the Yards Brawler. When compared side by side, the Yards’ taste is more subtle than the Matrimonial Mild, which is upfront with a more robust maltiness. It’s really rich and roasty with nice amount of caramel flavor mixed in, and I’m amazed how it smells just like my apartment on brew. The hops are there, but only subtly to help balance the flavor. There is a sweetness that creeps up a bit towards the end of the bottle, which is probably because the beer finished with a higher gravity than I wanted. Overall, this beer was met with many positive reviews, and seem to be thoroughly enjoyed by everyone. Especially the groom, who carried a bottle around with him for most of the night. The recipe formulation was a bit tricky. I’ve never brewed a Mild before, so it was great to have a reference to build on. Unfortunately their site gives you little information about what goes into the beer. Googling around also yielded few results for a clone recipe, or any information at all around a “Pugilist Style Ale.” So I had to go with was an English Dark Mild Style around 4.2% ABV. Grabbing my trusty copy of Brewing Classic Styles, I started building my recipe with the 4.2% ABV goal in mind. Milds typically lead with a toasty, roasted malt flavor, so I included a mix of Amber, Brown, Chocolate and Black malt on top of a modest amount of Maris Otter. Since the hops are there primarily to balance the malty sweetness, I went with 1 ounce of East Kent Goldings, a low Alpha Acid hop used mainly for bittering maltier beers. 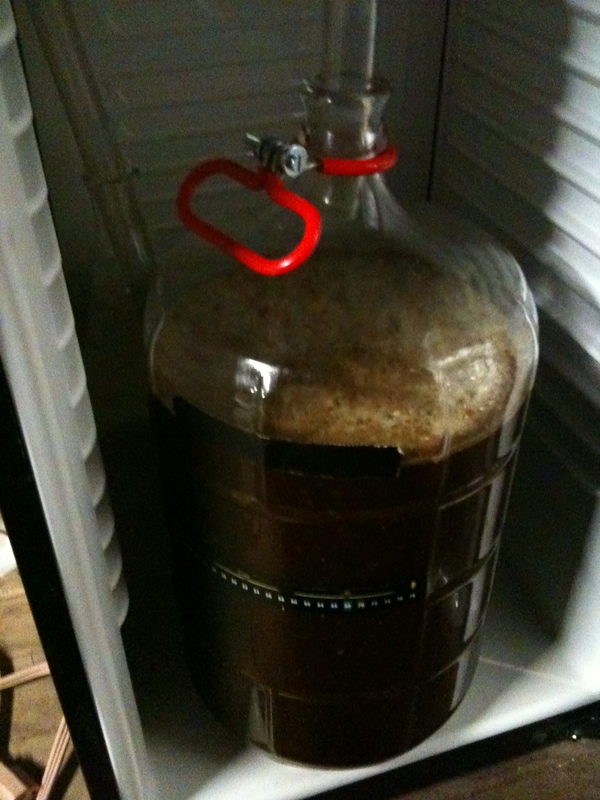 To stay true to this style’s English routes, I chose a London Ale yeast from Wyeast to ferment this beer. I bounced my recipe off of my brewing mentor Joe Postma. He countered with a similar recipe, but one that simplified the malt bill a bit and pulled in a few more Mild characteristics he thought were lacking. Most notably was the inclusion of Crystal 60 to impart a lot of caramel and roasted flavors into the beer. In turn, the Amber malt was eliminated, as was the Black malt since the beer was going to be fairly dark as it is. Fearing the East Kent Golding hops would be a little too much, I swapped them our for Fuggles. I had a lot of success with them in the past, and found other brewers who like them in Mild recipes as well. I also switched the London Ale yeast to a London ESB yeast after reading an experiment by my buddy Jason Rodriguez where he found the London ESB strain produced a pleasant fruitier flavor than the London Ale yeast. 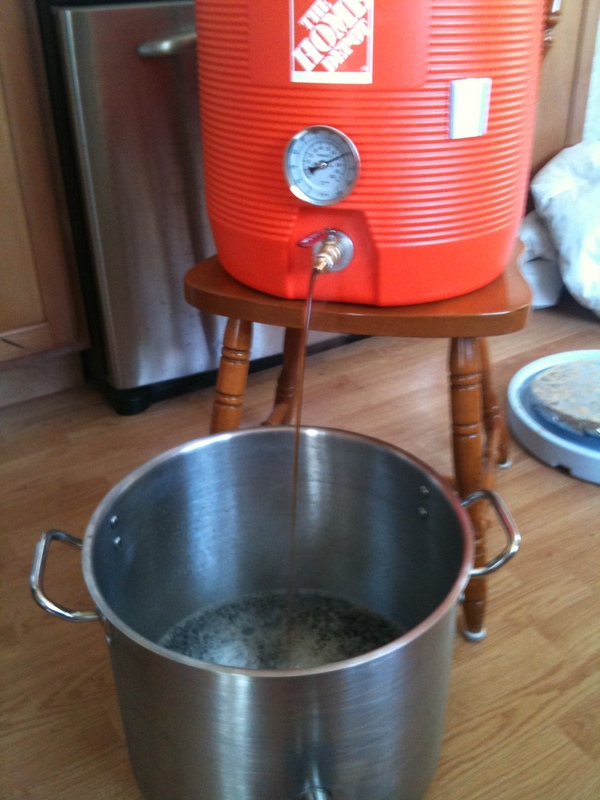 This was my first all-grain brew, so of course I was nervous going in. Luckily, brew day went pretty well. I nailed my mash and mash out temps, and batch sparging went well. The Fuggles clogged the filter in my brew pot, so I ended up having to dump the mash through a funnel with a filter to get it into the primary. 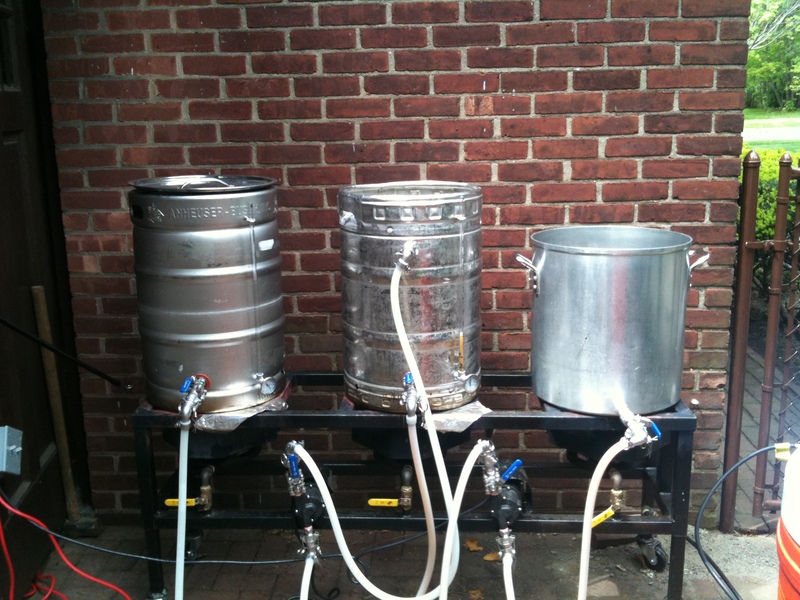 I also under-collected the amount of wort needed, and added about a gallon of water to the primary to hit 5 gallons. I left the beer in the primary for 10 days before checking the gravity, only to find the beer was 5-7 points higher than I wanted it to be. This means the ABV would be lower than I wanted, and the beer would have a more robust body. Since my goal was 4.2% ABV, I was a bit upset by this. Then I think I remembered the problem – I think I forgot the yeast nutrient on brew day, meaning the yeast could have fallen dormant earlier than they should have. To try to wake the yeast back up, I moved the primary upstairs, where the ambient temperature is about 10 degrees warmer than my basement. After a week upstairs, the temperature increase helped me shave 2 points off the gravity, ending up at 1.016 – about 3 points short of my goal. This was good enough for me, so I went ahead and bottled it up. Overall, from a brewing standpoint, I’m extremely pleased with this beer and the praise it’s received. For my first all-grain brew, I think I have a winner! Another step in my upgrade to all-grain was purchasing a free-standing propane burner. While my new apartment came with lots of storage space and a great layout, it also came with an electric stove. I have a few friends who brew on electric stoves and they hate it. 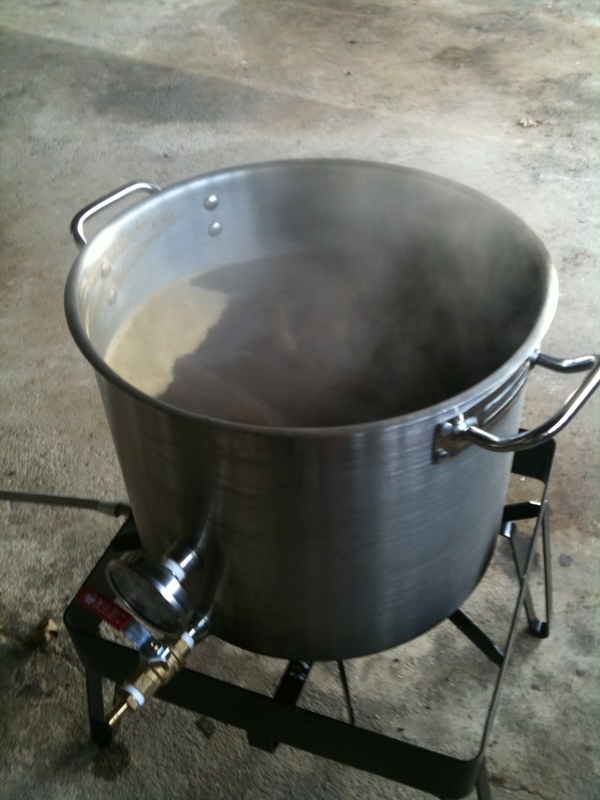 They say it takes forever to get the wort to a boil, and maintaining a consistent temperature is next to impossible. I hit the ‘nets and got to researching. I looked into a few options, the first being 4 free-standing electric burners. These high-output burners could give adequate power to boil 6+ gallons of wort, but balancing my brewpot between them all was an issue, not to mention the “ghetto” nature of putting a pot on 4 different burners at once. 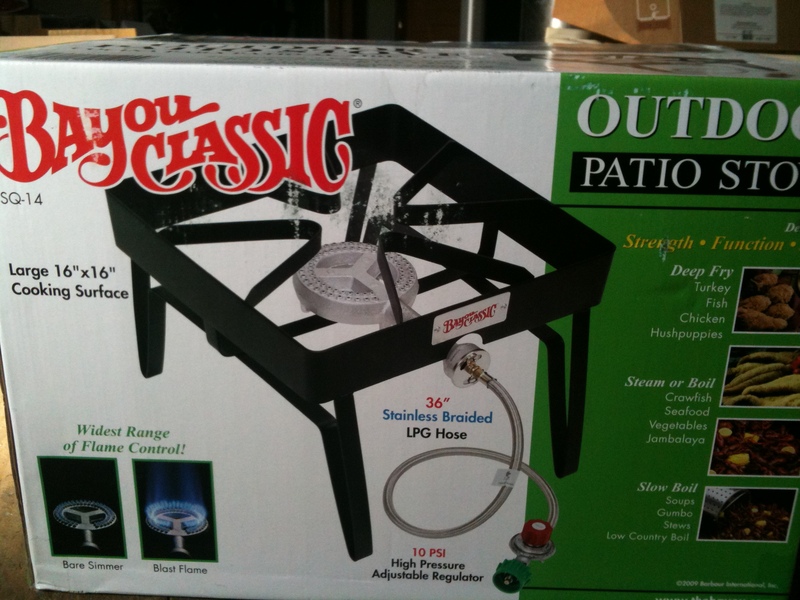 In the end, the most logical step was the one most homebrewers have already taken – getting a free-standing propane burner. I got acquainted with the different burners out there, and narrowed down my preferences to a quality burner with good output and a low PSI so I didn’t burn through propane like crazy. I decided on the Bayou Classic SQ14 Single Burner Outdoor Patio Stove. The 30,000 BTUs was a pretty good amount of power, and the 10 PSI regulator would keep my propane use at a reasonable level. Plus, at $50, it was pretty affordable. So far – I love it! It kicks pretty good. 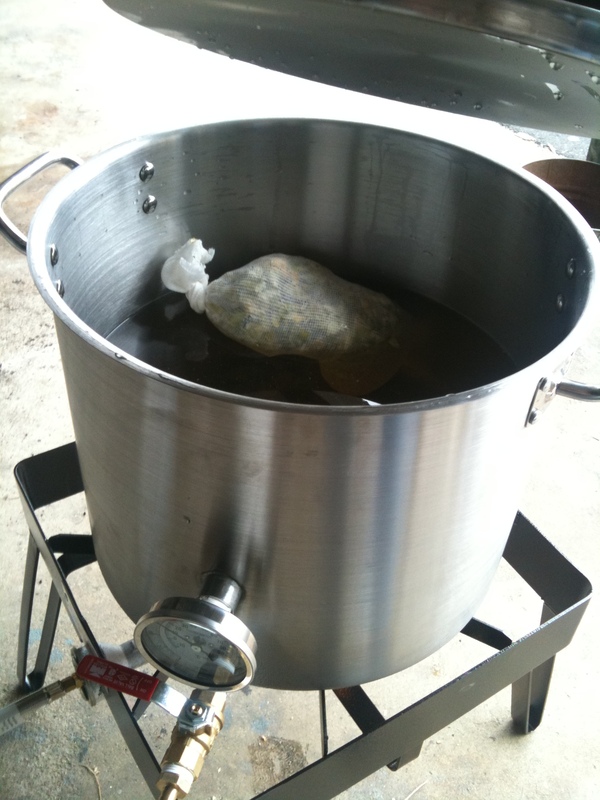 I can get about 6-7 gallons of wort to a boil in about 15 minutes. It’s a far cry from the hour plus it would take on the electric stove. It has an oxygen regulator as well, which lets me get a nice blue flame to shave a few minutes off the time to boil. Plus, I’ve started heating up my sparge water with it. I can start the burner right before I mash out, and when the 10 minutes of the mash out are up, the water’s already at 170 degrees. This burner has really shaved a lot of time off my brew day, and has helped me produce better beer. Welcome! You must be 21 years old to visit this site.